Apple on Tuesday was awarded a patent for harnessing onboard iOS device sensors to automatically switch from one location subsystem, such as GPS and indoor wireless gateway proximation, to another seamlessly and without user interaction. As granted by the U.S. Patent and Trademark Office, Apple's U.S. Patent No. 9,066,207 for "Managing states of location determination" describes a system by which portable devices leverage location, communications and other sensors to gather information that can help determine state of motion and venue. In exemplary embodiments, an iPhone is capable of providing seamless directions from a car, outdoors or in buildings. In practice, a user device determines its current state using a first sensor subsystem. For example, an iPhone gathers location information outdoors through reception of GPS satellite signals. Apple refers to unobstructed outdoor states as venue-independent. 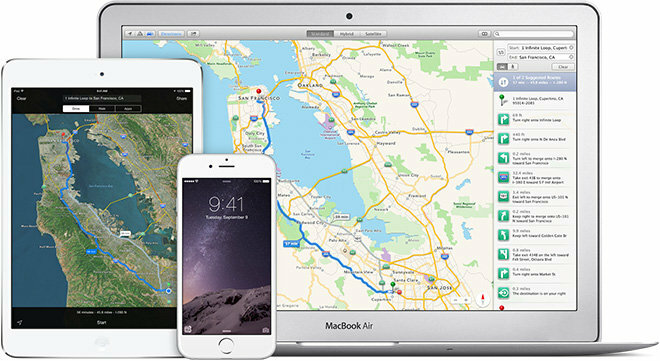 As with the current Maps app, mapping servers provide navigation and real-time location information. Moving into a building or other areas in which GPS is unavailable defers device operation to a venue-specific state. In lieu of GPS, structures might contain wireless access points whose RF signals might be stored in a fingerprint location database. Alternatively, a change in state may be determined when an iPhone senses barometric pressure fluctuations denoting changes in elevation between floors of a building. Data from onboard gyroscope, hygrometer, microphone, accelerometer or light sensors also inform the process. Importantly, the transition procedure expects a second subsystem to be capable of rendering a more accurate location estimation than the first. Transitioning between a weakening GPS signal to a stronger indoor RF signal, for example, is sufficient to perform a handoff. Switching from a venue-independent state to a venue-specific state, the mobile device pull data for a venue map like an indoor map. In such situations, specialized venue maps are provided for pathing through hallways, rooms, walls, offices and other identifiable features. 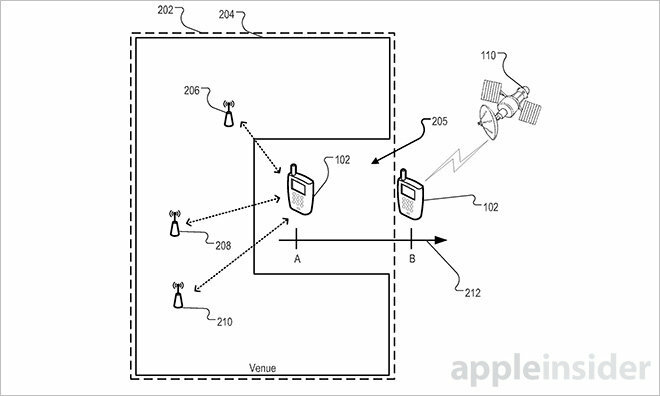 While not mentioned by name, Apple's iBeacon microlocation technology would seamlessly into today's patent. Bluetooth-enabled iBeacons could theoretically replace wireless access points in Apple's document, providing accurate location data while providing an interactive indoor mapping experience. Apple has yet to roll out consumer facing technology acquired through its purchase of indoor mapping startup WiFiSLAM in 2013. Today's patent, however, is an indication the company still plans to expand services beyond street maps. 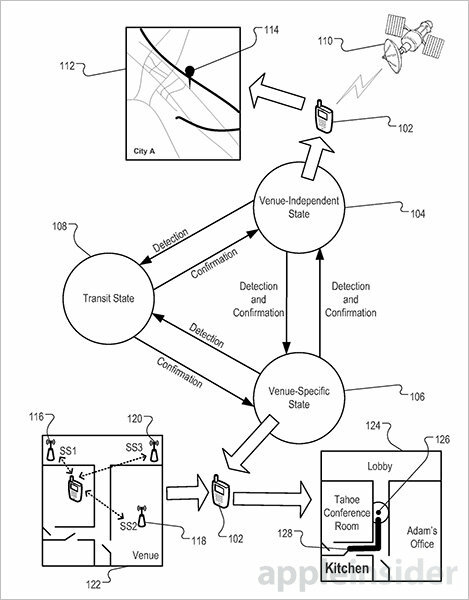 Apple's patent for a self-determining, venue-based location system was first filed for in December 2012 and credits Lukas M. Marti, Robert Mayor, Shannon M. Ma.